There will be a thousand sailing stories told about this year’s Mac and Hook races. Undoubtedly, most will be about the pain and suffering of sitting and spinning in the large windless holes that spotted the lake on day two. And someone will probably declare that lives were saved by ruling out J-30s (among a few other seaworthy keelboats) from one of the races. The other race, I’m sure, is pleased to have them. 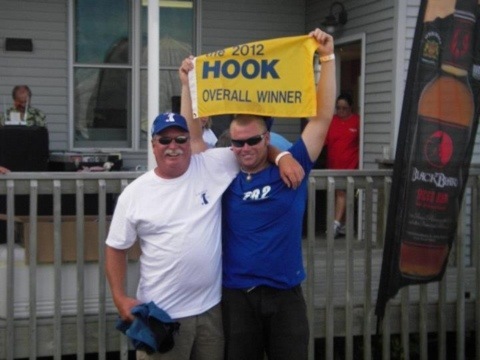 But the biggest story, in my view, mustn’t go unnoticed, and it is that the overall winners of the 2012 Hook Race were a father and son team double-handing their mid-70s era Peterson 34 to the best corrected time in any division. Stu and Sam Keys, of Sturgeon Bay Wisconsin, are the supreme, albeit unexpected, champs. The ultimate Hookers. No matter that this year’s fleet was the most competitive in years, featuring Art Mitchel’s Golden Goose (Farr 36 OD) with a 6 second/mile scratch boat handicap, no less than four overall winners in the fleet, and at least two 2-time overall winners in division one, Rick Trisco’s Tango in Blue and my own Syrena. It would be easy to assume that conditions might have favored the Keys’ boat Thunder, but that would be a large mistake. A modest southerly gradually petered out on Saturday and was replaced with a crisp northeaster on Sunday. You had to be able to run, reach and beat, and make adjustments smartly and quickly. The wind direction spun a full 360 degrees in about 24 hours and then spun again. It wasn’t simple sailing and in the end, conditions generally favored big kites and athletic, nimble, well-fed and rested teams on newer boats. Stu and Sam Keys were not deterred. They had practiced and raced together enough to be able to execute complex maneuvers at the same pace of a fully crewed program. They had learned to work together on not much sleep. They studied the fleet. But not just the double-handed fleet; the entire fleet. They settled on a strategy of attacking the past-winners, sailing to Thunder’s strengths, and not letting a soft spot slow them down. Dad and son wanted this race. Partly because the Hook has a long tradition as a race of families and other underdogs. It’s just low key enough to not capture the attention of folks who might buy a win, and that leaves a lot of hard-core offshore sailors of all ages to battle it out on the level. And then, Sam, aptly nick-named Thumper, tore it up at the dance party, dad looking on with a raised eyebrow. You can tell that they have a special relationship, this father and son. Parts of it are as you would expect, and other parts seem downright miraculous. Like their massive Hook win. It’s the biggest story of the biggest sailing weekend in the Midwest. Couldn’t agree more with the premise of your article. I sailed the Hook on Golden Goose (one of your fast, nimble boats) and the thought of maintaining a racing focus with just 2 crew for a much, much longer period of time than we did is pretty impressive. And large KUDOS to you and the other Golden Geese for a fine first in division, and second overall. Great going! You are currently reading Hooked for life at Saving Sailing.